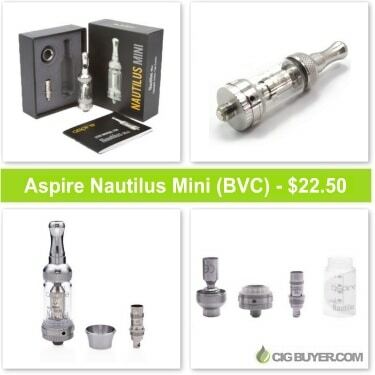 The full-size Aspire Nautilus is widely considered one of the best clearomizers on the market, and the Mini Nautilus is just as highly regarded; a smaller, slimmed-down version with virtually all of the same features. Instead of a large 5ml tank, the Mini has a smaller 2ml tank with the same “BVC” (Bottom Vertical Coil) technology and 4-port adjustable airflow design which makes customizing the draw on your device a snap. It’s super easy to refill and maintain, and it performs exceptionally well.